To finish up a look around my garden at the close of May attention turns to the Meditation Circle. My original vision for this area was to feature the walls of the labyrinth with evergreen or semi-evergreen, flowering plants. Too-narrow planting areas, weather, soil condition, moles and now even fire ants have impacted this area and distracted me from taking this beyond the original concept and the first experimental plantings. 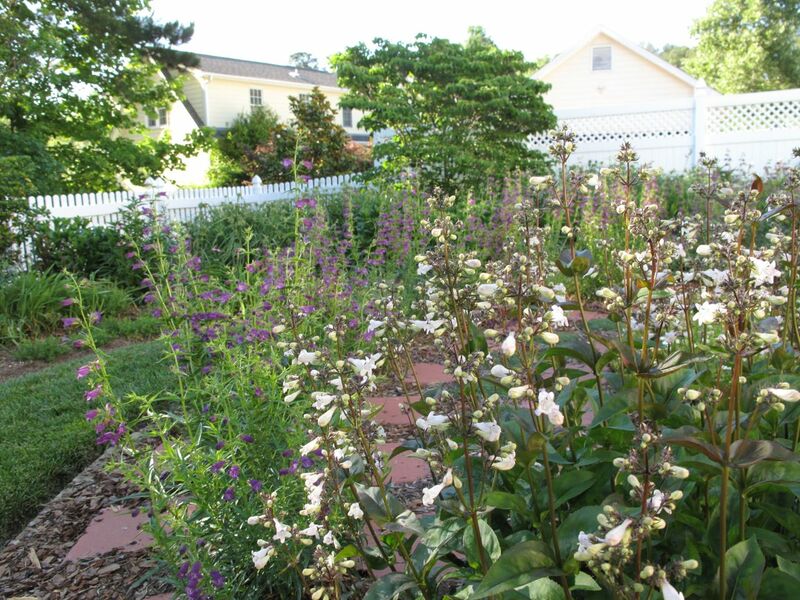 Nevertheless, the two types of Penstemon in bloom since mid-May have contributed greatly to the overall spring garden. 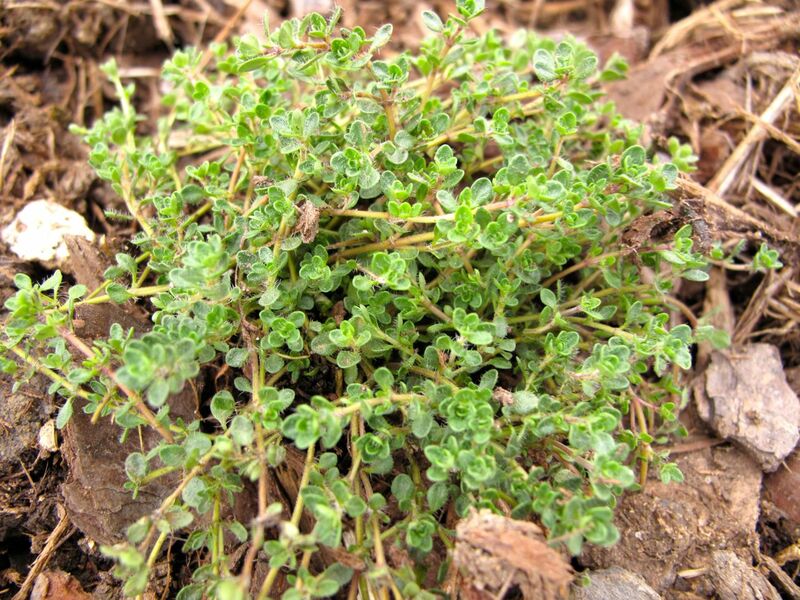 As early as mid-March, well before the flowers came on, the foliage was recovered from the stress of winter and looked attractive, especially ‘Husker Red.’ A curving row of low-growing Thyme has filled in well between the stones. Several other Thymes have been added to the center. Last year Alyssum, an annual, bloomed prolifically into late fall near the house, so I thought to try some along the meditation path. It has been very slow to take hold but I hope it soon will help conceal the mulch. There have been very few bees so far in the garden this spring but yesterday this one was working its way around another penstemon, this one next to a large stand of Monarda didyma (Scarlet Beebalm) near the house. Flowers are forming but there is no bright red yet on the Monarda. 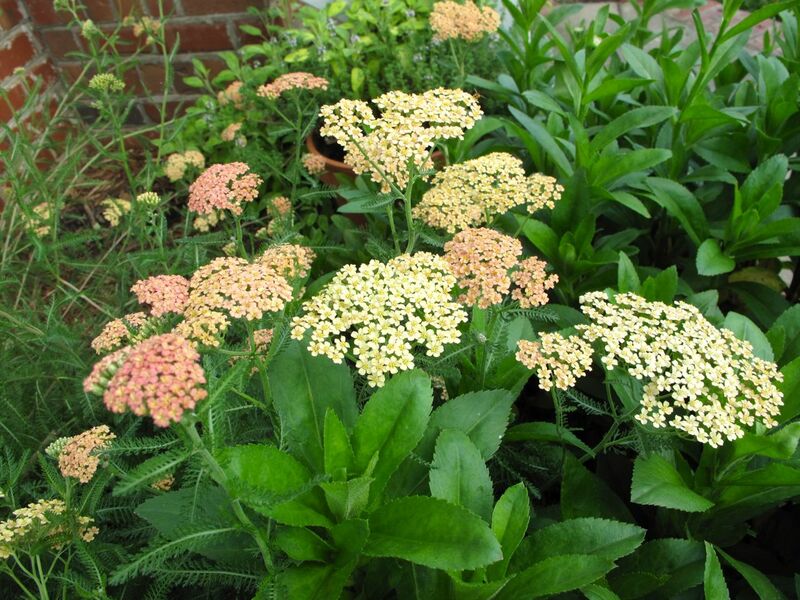 Along the house at the opposite end from the Monarda is an Achillea whose color and name I adore: Appleblossom. Usually I would not feature the foundation of the house but I like the way the soft hues of this flower work with those in the bricks. 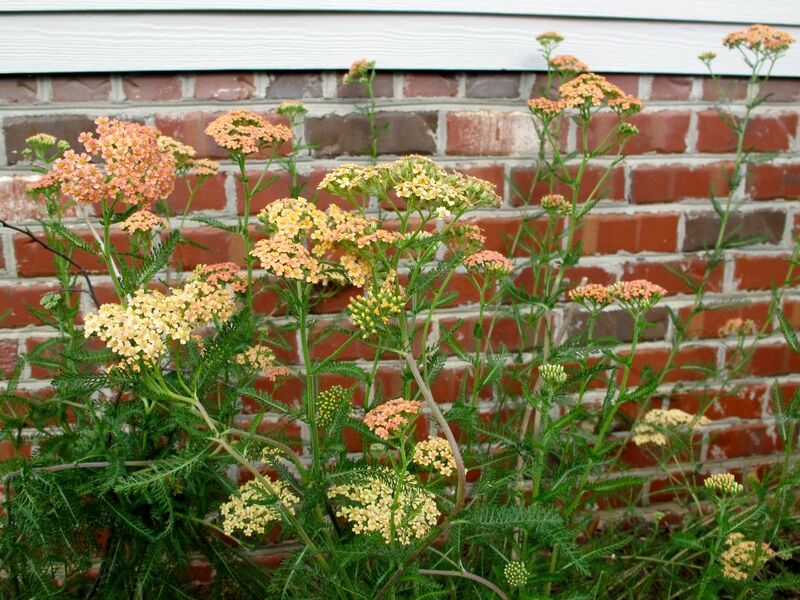 This Achillea is floppy and defies my attempts to hold it up. It seems to enjoy leaning on the Shasta Daisies in front. May is done until next year. Welcome June. 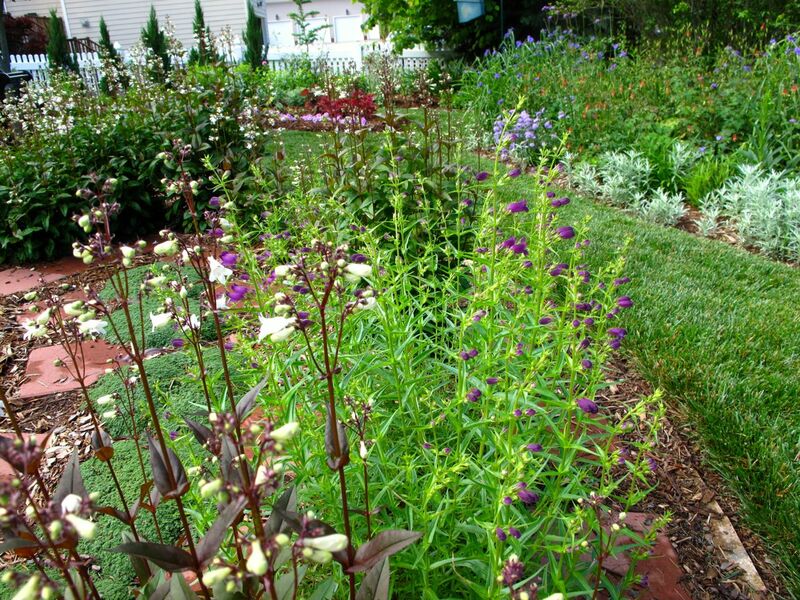 This entry was posted in garden and tagged meditation circle, meditation garden, meditation path, penstemon digitalis husker red, Penstemon mexicali 'Pike's Peak Purple' (Beardtongue), yarrow on June 1, 2013 by pbmgarden. 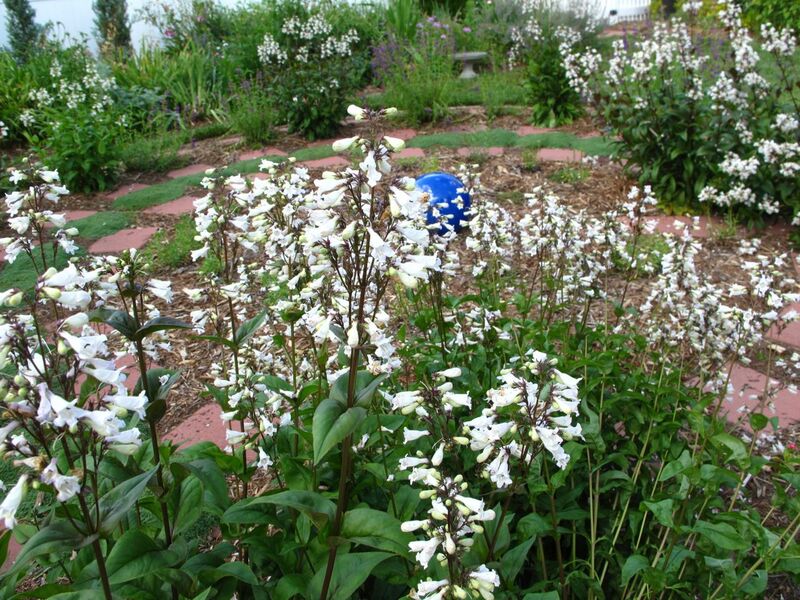 Two types of Penstemon (Beardtongue) grow in the meditation circle where they form part of the labyrinth’s wall. 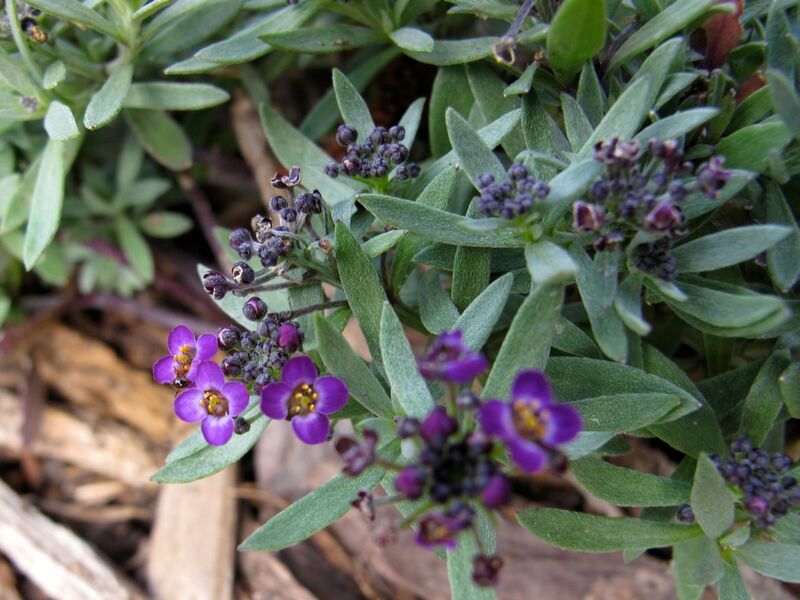 These were among the original plants I experimented with when once the path was complete. 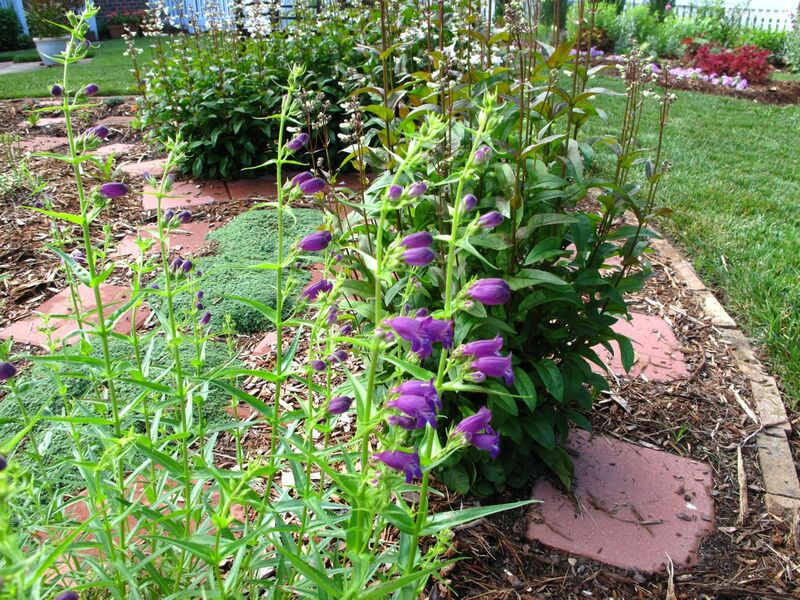 Last summer about half of the Penstemon mexicali ‘Pike’s Peak Purple’ died out, but by then I had some self-seeded transplants of Penstemon digitalis ‘Husker Red’ I could use as replacements. 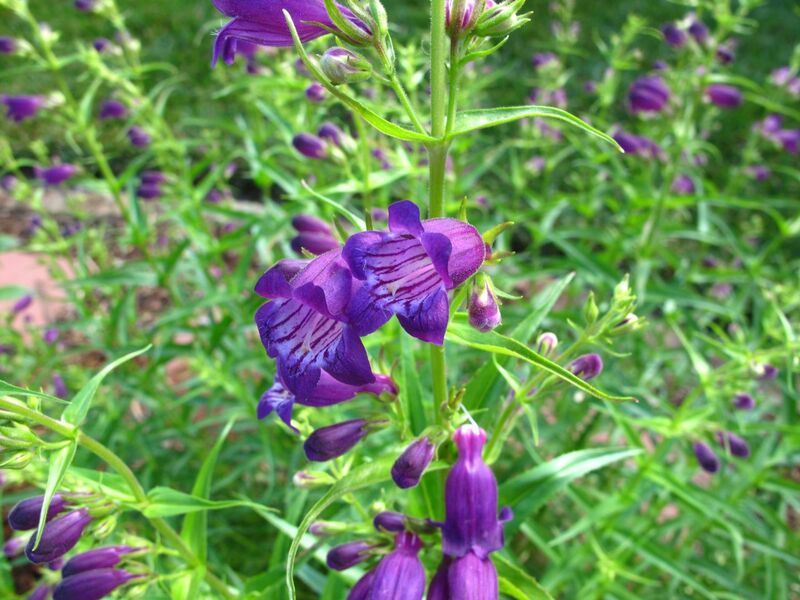 Both kinds of Penstemon started blooming this week and though the original design is no longer intact, the overall effect is a happy one for now. 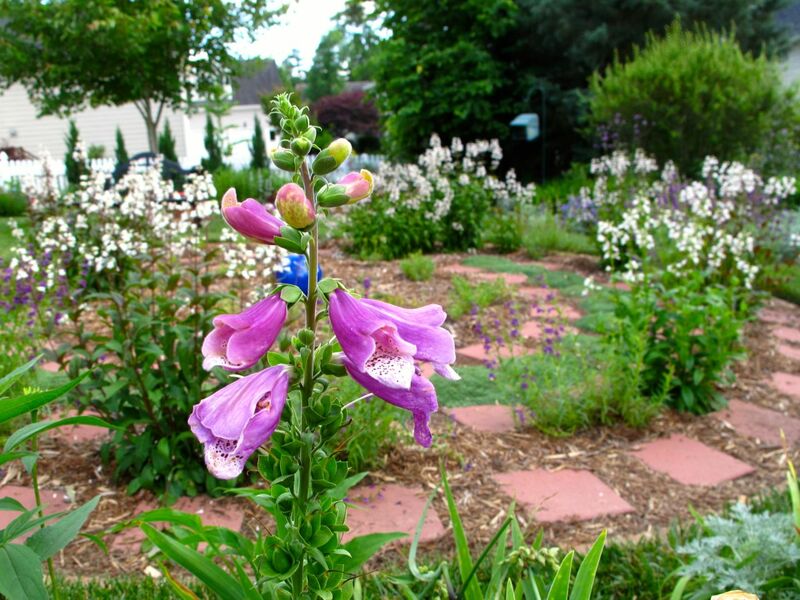 This entry was posted in garden and tagged labyrinth, meditation circle, meditation path, penstemon digitalis husker red, Penstemon mexicali 'Pike's Peak Purple' (Beardtongue), spring garden on May 24, 2013 by pbmgarden. It is Garden Bloggers Foliage Day (GBFD), an opportunity to notice the value foliage plays in the garden, as feature or support. GBFD is hosted by Christine at Creating my own garden of the Hesperides. 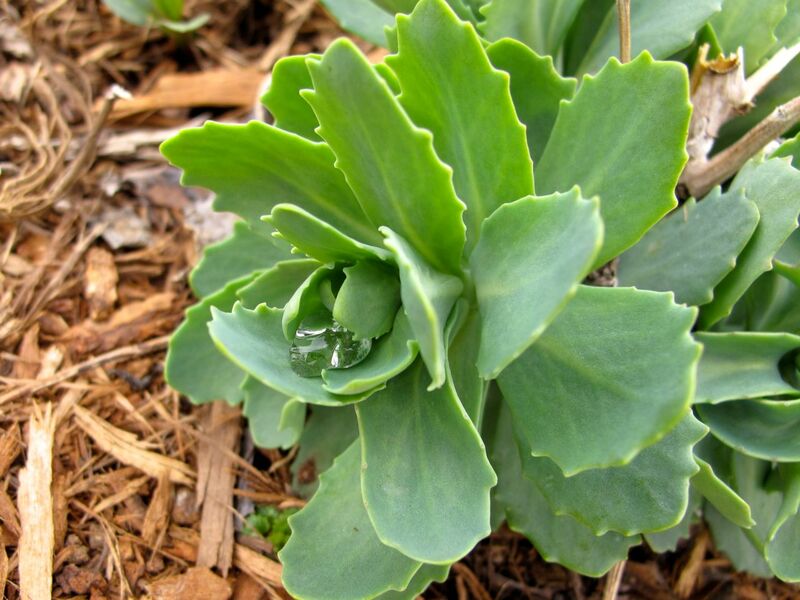 This month I have been watching as clumps of perennials shake off some of the ragged winter look and start greening. Monarda is growing noticeably and it smells delightfully minty. Penstemon digitalis ‘Husker Red’ seeded freely last year so there are several tucked into places now other than just in the meditation circle. 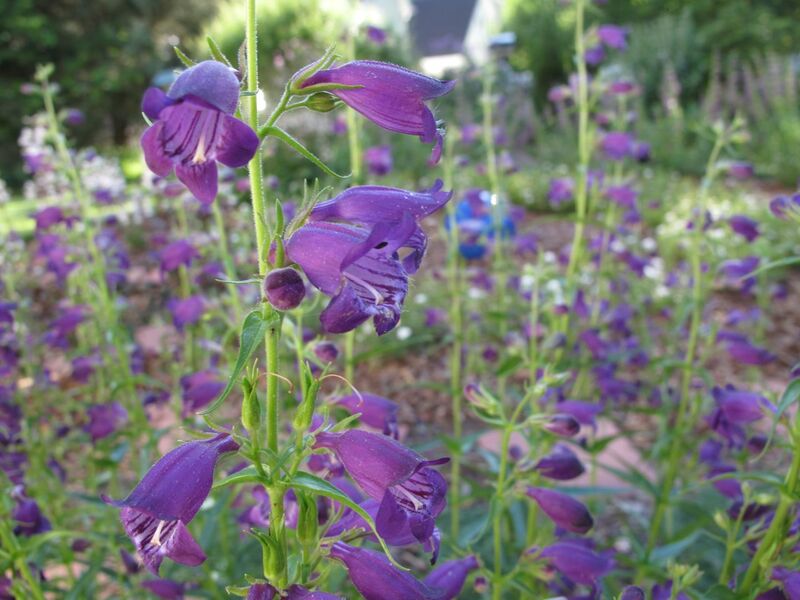 Penstemon mexicali ‘Pike’s Peak Purple’ (Beardtongue) began dying out in the meditation circle last summer. Highly drought-tolerant plants, they seemed ideal for this spot, but the summer through winter were unusually wet. Combined with some pesky mole activity the condition of these penstemon worsened. So nearly half of the Pike’s Peak are gone. Earlier in the week I pruned the remaining plants and am hoping they will bloom. 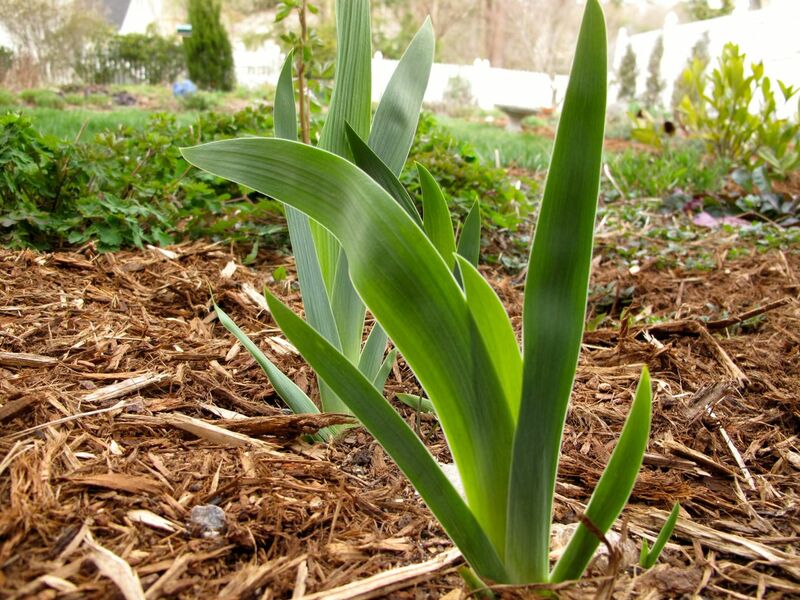 Iris leaves are up everywhere. This is Iris ‘Davy Jones’ (Davy Jones Bearded Iris) making its debut this year. 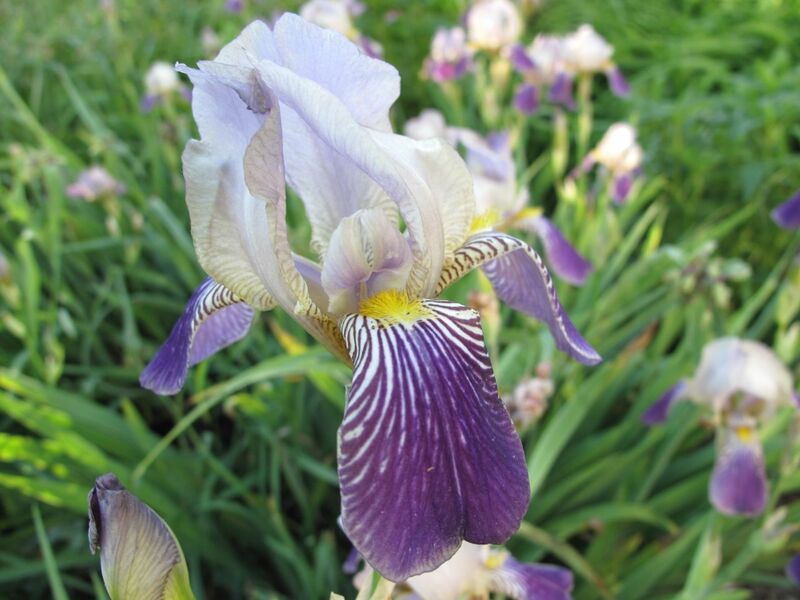 It is a Tall Bearded Iris with a purple ruffled bloom. 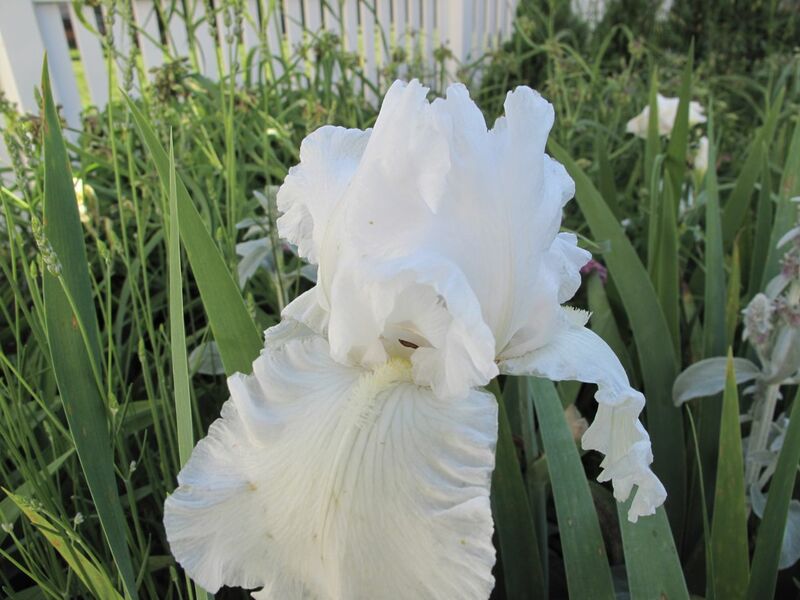 Tall Bearded Iris are among the last to bloom. 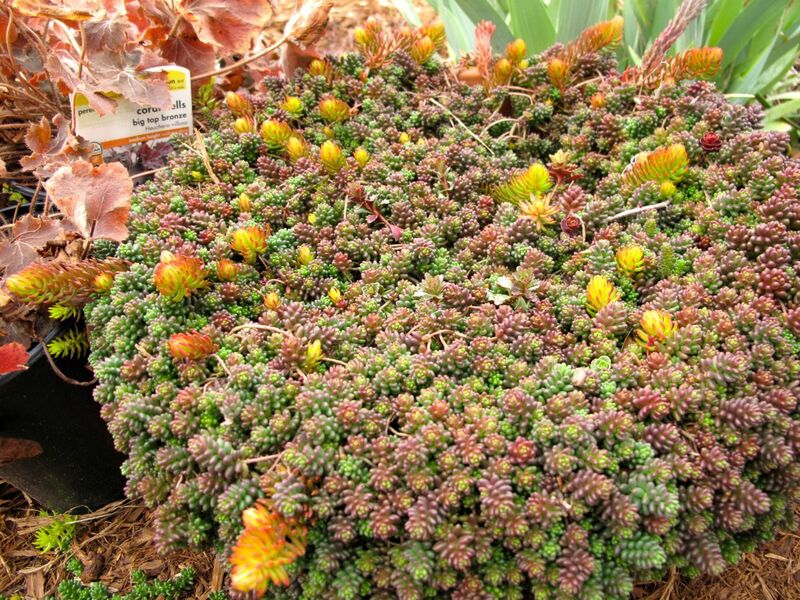 Autumn Joy (Stonecrop) in several spots are contributing interest at this time of year as is an overflowing pot of colorful mixed Sedum that I added to the garden last spring. Rudbeckia hirta ‘Irish Eyes’ is forming a nice mound of fresh leaves. 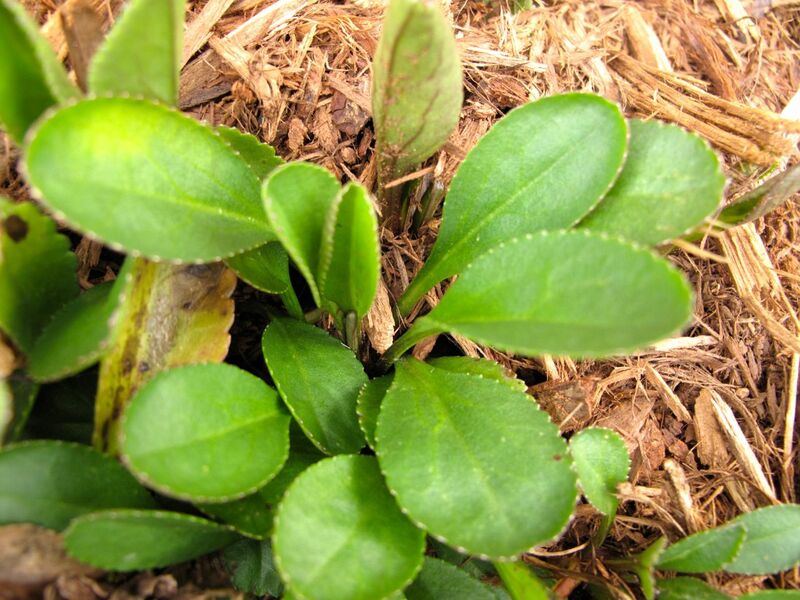 Shasta Daisy has taken a strong foothold and needs some serious attention to keep it from gaining any more. Gaura lindheimeri ‘Passionate Blush’ (Butterfly Gaura) sports colorful leaves this time of year. I have been unhappy with its performance in this location and need to find it a better spot. 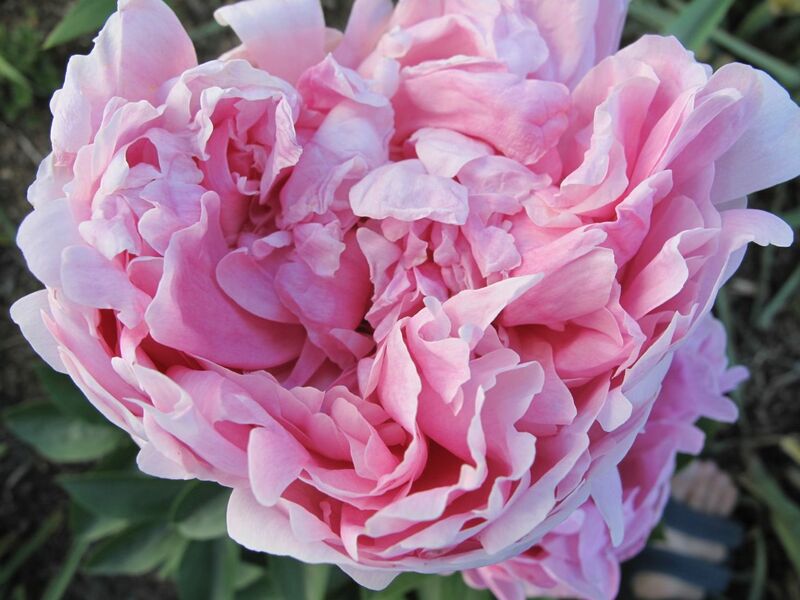 It became very floppy and did not bloom very well. 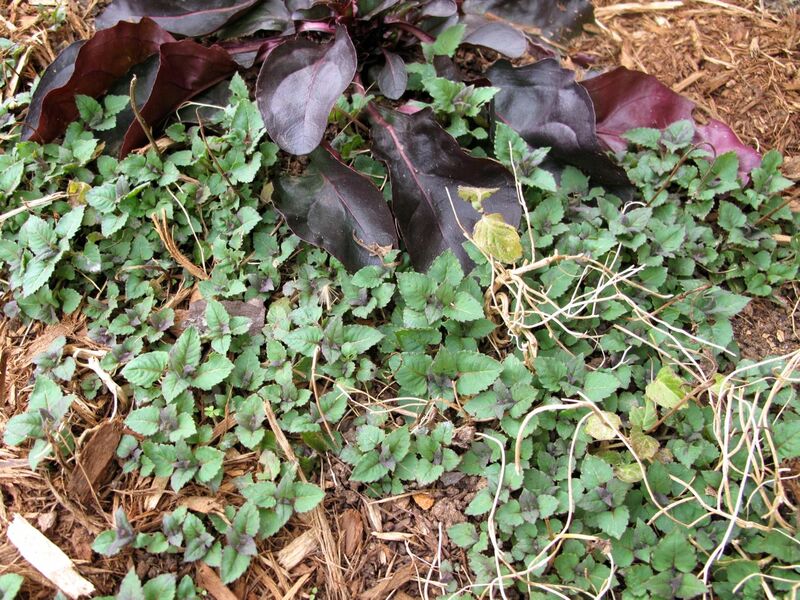 Aegopodium podagraria(bishop’s weed) sprang up through a thick mulch layer this week. I was hoping to suppress it and have for years been wanting to manage it. This is invasive but lovely as a ground cover and was a pass-along from a dear friend many years ago. 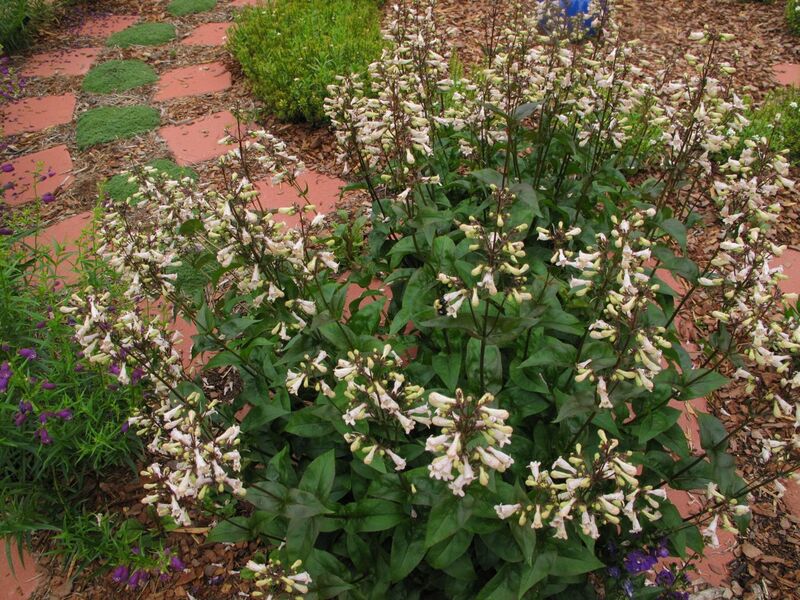 Meadow Sage ‘May Night’ is a nice plant for the front of the border. I’m gradually increasing their number. Looks like I should be dividing this clump but am not sure if it is a good time. 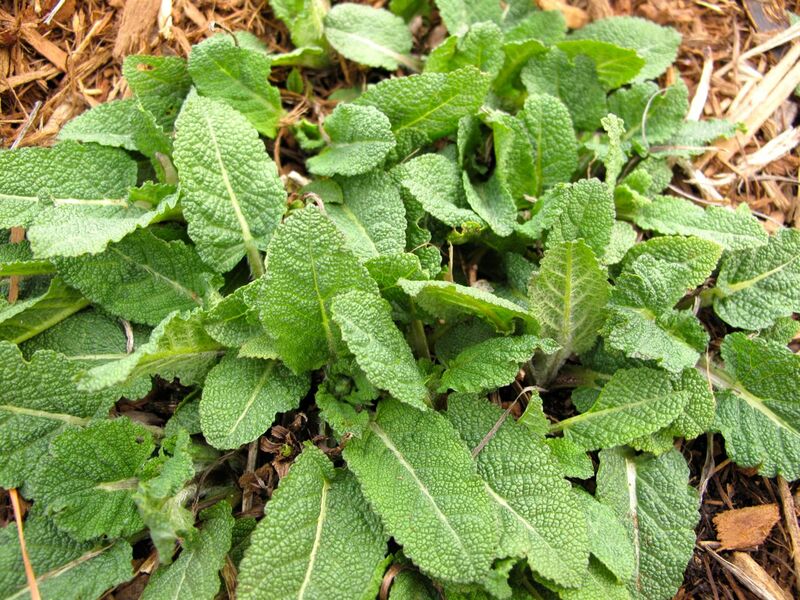 So as March winds down many individual plants are contributing their foliage shape, patterns, colors and textures to add interest to the early spring garden. Thanks to Christine at Creating my own garden of the Hesperides for hosting GBFD each month. This entry was posted in garden and tagged Aegopodium, Autumn Joy Sedum, Bearded Iris, Garden Bloggers Foliage Day, gaura, GBFD, Meadow Sage ‘May Night’, meditation circle, meditation garden, Monarda didyma, penstemon digitalis husker red, Penstemon mexicali 'Pike's Peak Purple' (Beardtongue), Rudbeckia hirta 'Irish Eyes', shasta daisy, thyme on March 22, 2013 by pbmgarden. 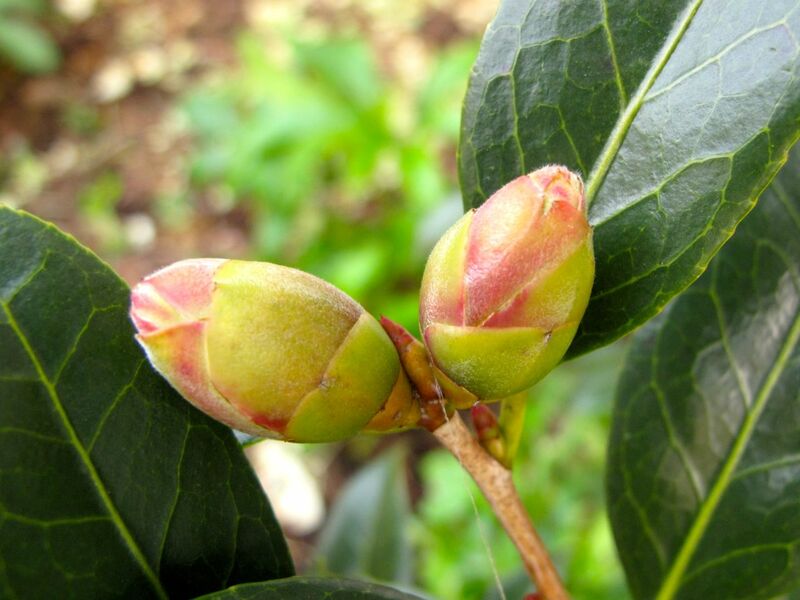 Remembering that many plants were on an extremely early blooming cycle last year, I have been curious about what this year’s timing might be like for the garden. For the last few weeks I have watched expectantly for the first Hellebores of the season and today I finally noticed an open flower. Last winter (2011-2012) these hellebores bloomed very early, by December 30, 2011, whereas the winter before that (2010-2011) there were no blooms until several days after Valentine’s Day. So they are somewhere in-between this year. 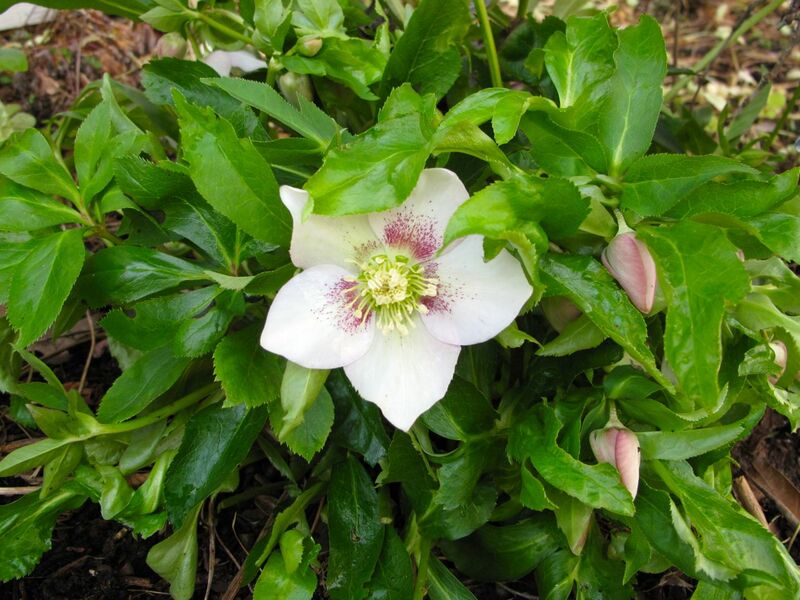 I have never been bothered by the leaves on hellebores, but enthusiasts recommend pruning them before the buds begin forming to make it easier to enjoy the blossoms. Too late to do it properly but today I carefully trimmed away many of the lower, older leaves. They do look tidier after this cleanup. The garden is saturated from recent rains. I was surprised to see moss growing along the northern side garden where the hellebores and the ‘Coral Delight’ are planted. The high temperature reached a fine 72°F this afternoon, well above the average 54°F for this time of year. The nice warm weather should stay through Monday so I hope to finally tackle some weeding chores I have been putting off. My time in the garden was brief today, but I did take a few minutes to walk the labyrinth. As I stepped along the path I smiled to note how well the Penstemon digitalis ‘Husker Red’ has worked to supply some year-round interest. This entry was posted in garden and tagged almanac, Camellia 'Coral Delight', Hellebores, penstemon digitalis husker red on January 12, 2013 by pbmgarden. 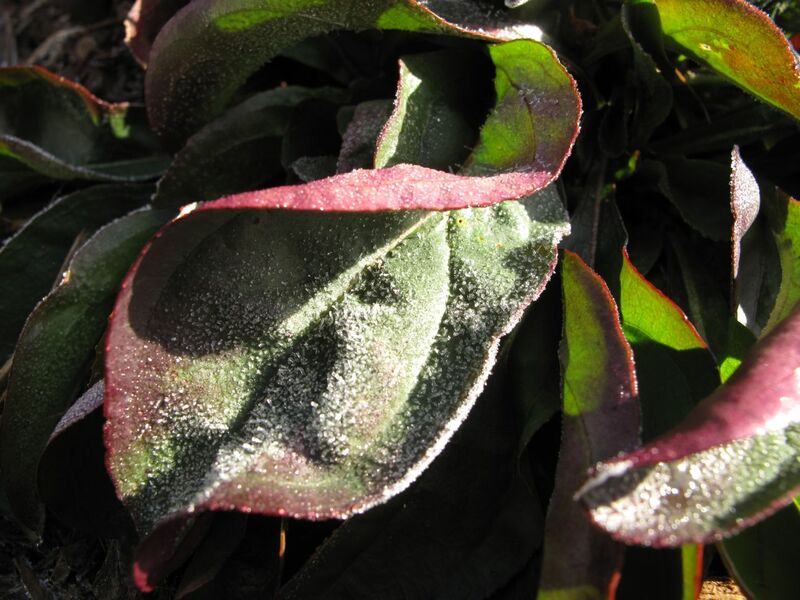 During my frosty morning walk the sun had just begun to peek into the meditation garden, illuminating the burgundy and green hued leaves of this Penstemon digitalis ‘Husker Red’ (Beardtongue). 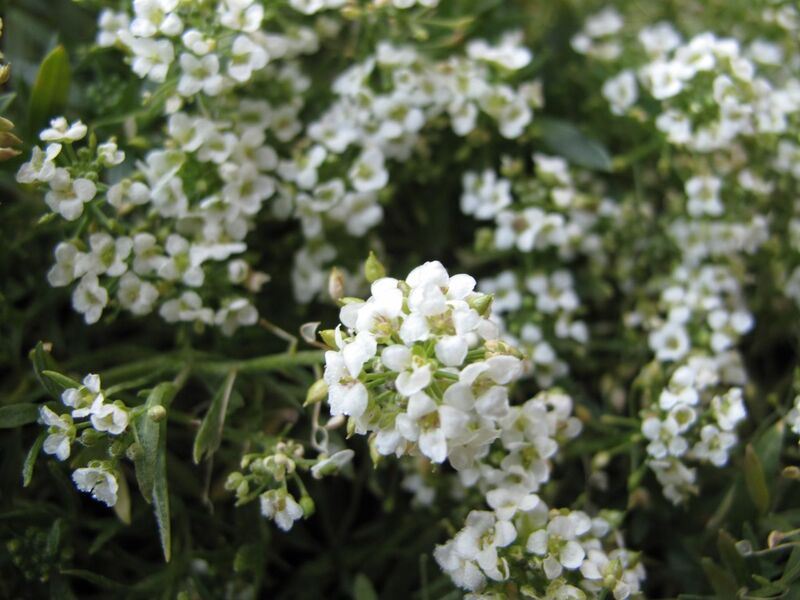 A patch of Lobularia hybrid ‘Snow Princess’ (Sweet Alyssum) from summer surprisingly has withstood the cold nights. This delicate-looking annual is reputed to be cold hardy (and heat tolerant), but probably Its location near the foundation of the house is giving it some extra protection. 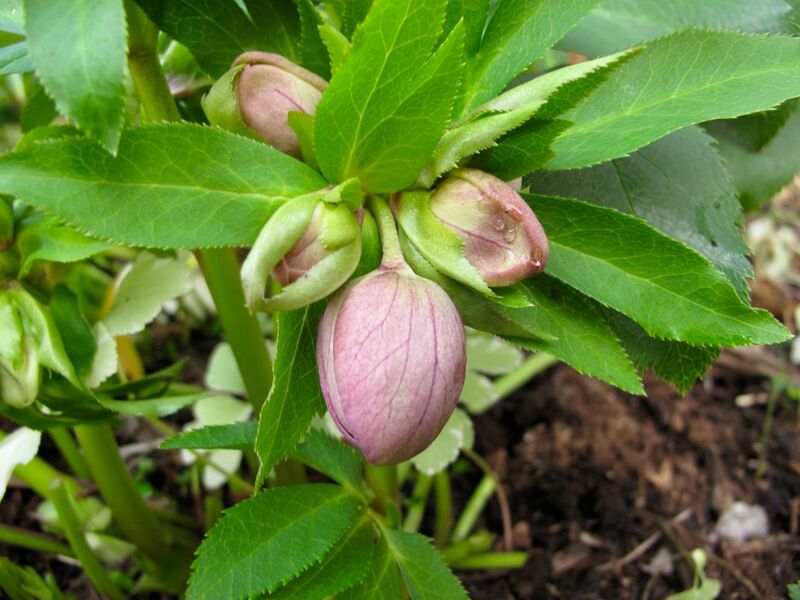 Hellebores are not as early in blooming as last year, though I did find a few fattening buds. Camellias continue to bloom and provide sweet fragrance. 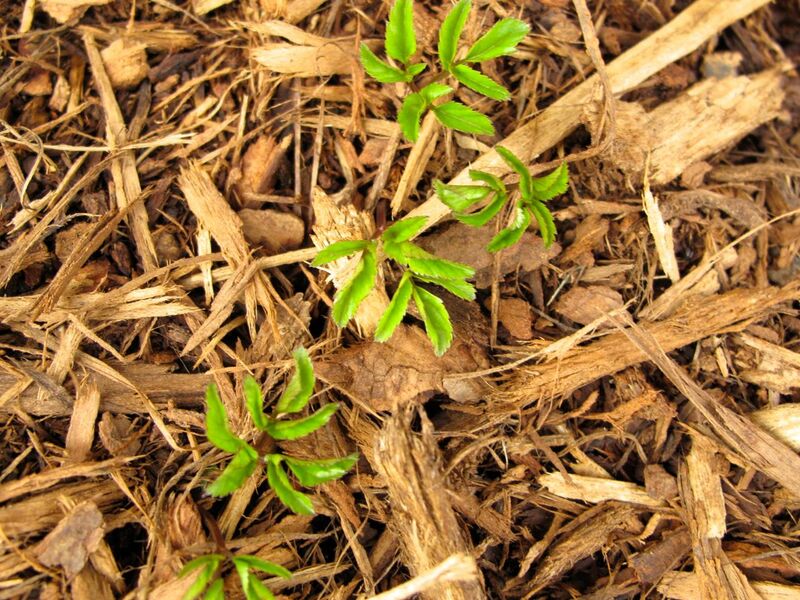 Several Iberis Sempervirens (Candytuft) flowers are visible but nothing to compare with last year’s early and prolonged display. Weeds are cropping up around the beds, especially the rather invasive Cardamine hirsuta (Hairy Bittercress). The garden is overdue for a few heavy maintenance days. Finally, one plant I noticed and photographed during a recent arboretum visit was Abutilon megapotamicum ‘Little Imp’ (flowering maple). Native to Brazil this shrubby mounding plant begins blooming in spring and still carried a quite a few of its little lanterns on the last day of December. The red calyx (or group of sepals) surrounds the yellow flowers to form its little lanterns. 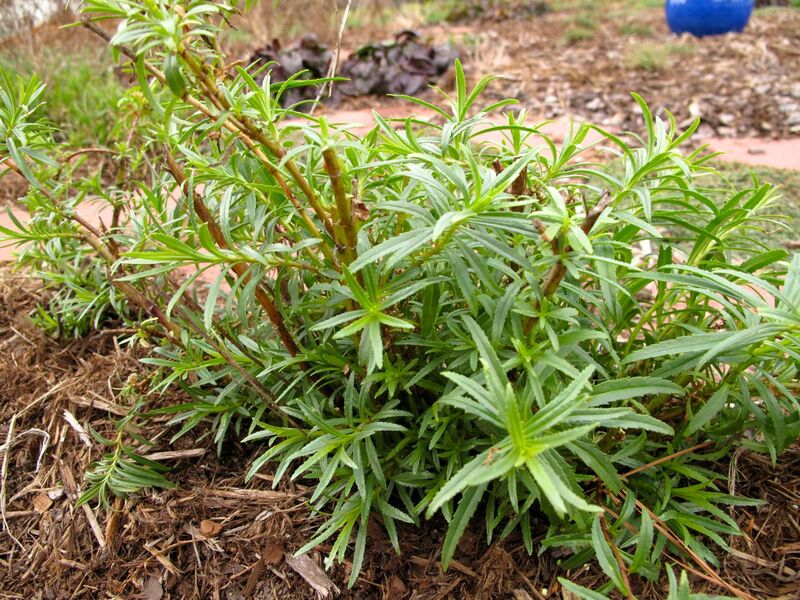 This entry was posted in garden and tagged iberis sempervirens, meditation garden, nature photography, penstemon digitalis husker red, perennials, photographing nature, winter garden on January 5, 2013 by pbmgarden. Walking the labyrinth late this afternoon provided an opportunity to consider the wall plantings in between the paths. 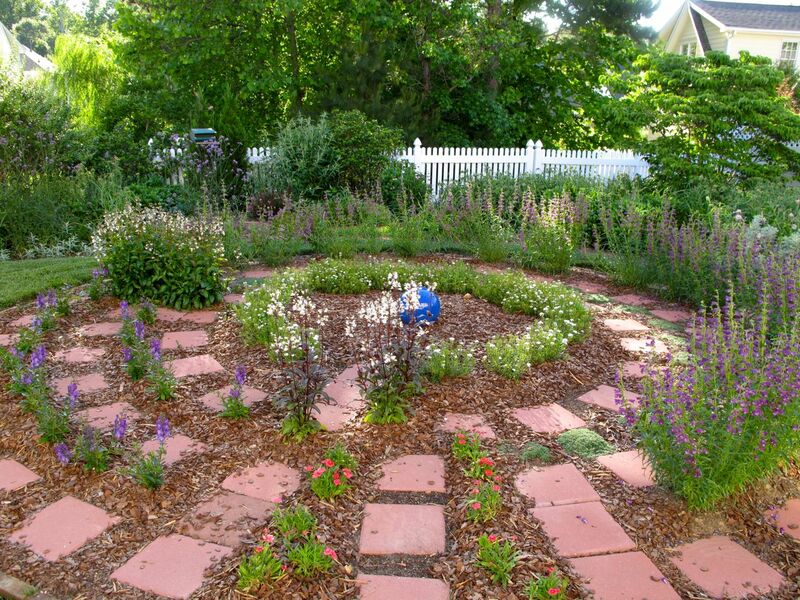 The meditation circle is lush and pleasant now, even the thyme has been rejuvenated. The circle is full of bees humming and buzzing about. 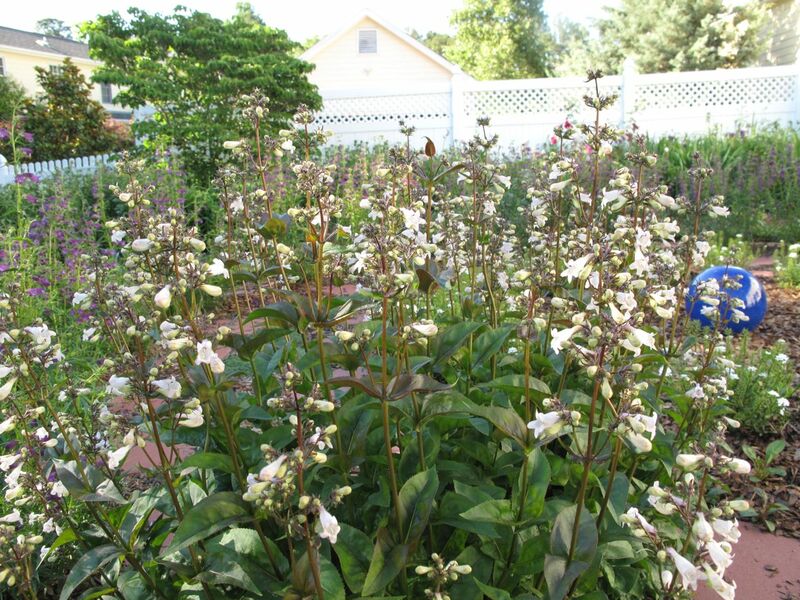 The bees are drawn to both types of penstemon found here. 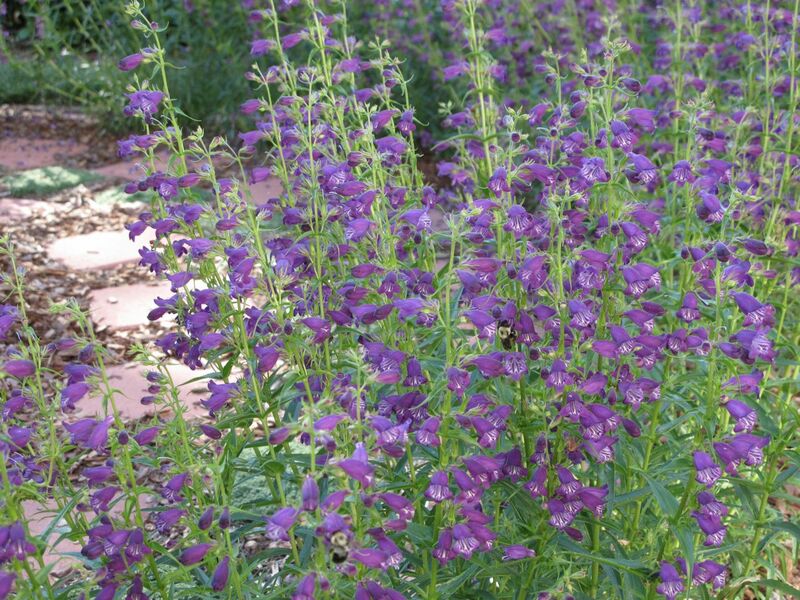 The Penstemon mexicali ‘Pike’s Peak Purple’ (Beardtongue)with its looser habit has already required staking in order to keep the pathway clear. Unless visitors are coming I rarely worry about the flowers tumbling around, I just brush past them as I walk, simply noticing the connection. 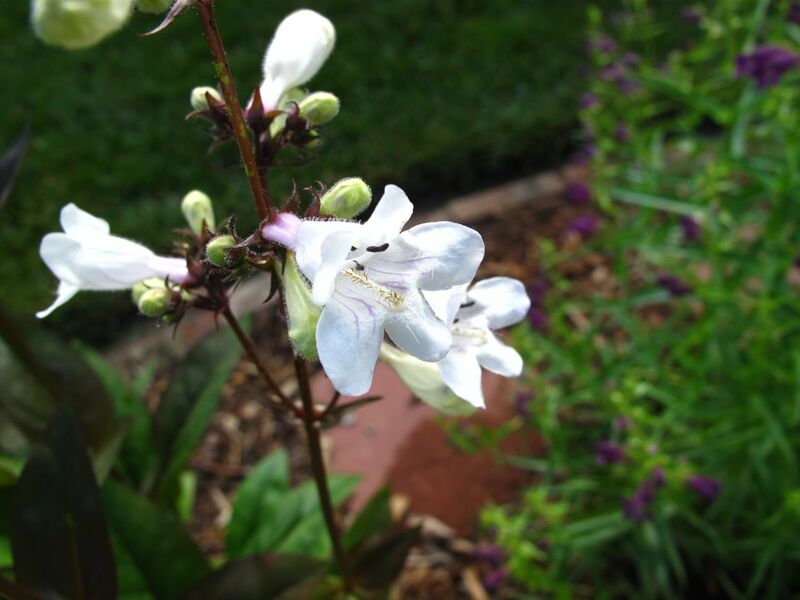 Penstemon digitalis ‘Husker Red’ (Beardtongue) has been blooming for several weeks and I really enjoy its white flowers. Its growth habit is more upright than ‘Pike’s Peak Purple.’ Even so, the two ‘Husker Reds’ planted last year are getting quite large and recent rains knocked over a few sections of the plant into the path. Trimmings are nice though as penstemon is long-lasting indoors. 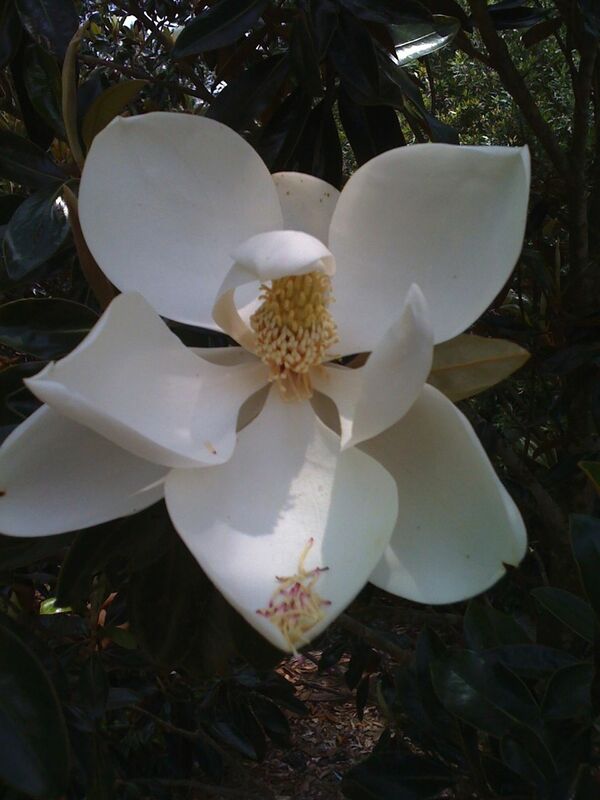 Magnolias are blooming. This one was spotted today at the Nasher Museum of Art in nearby Durham, NC. 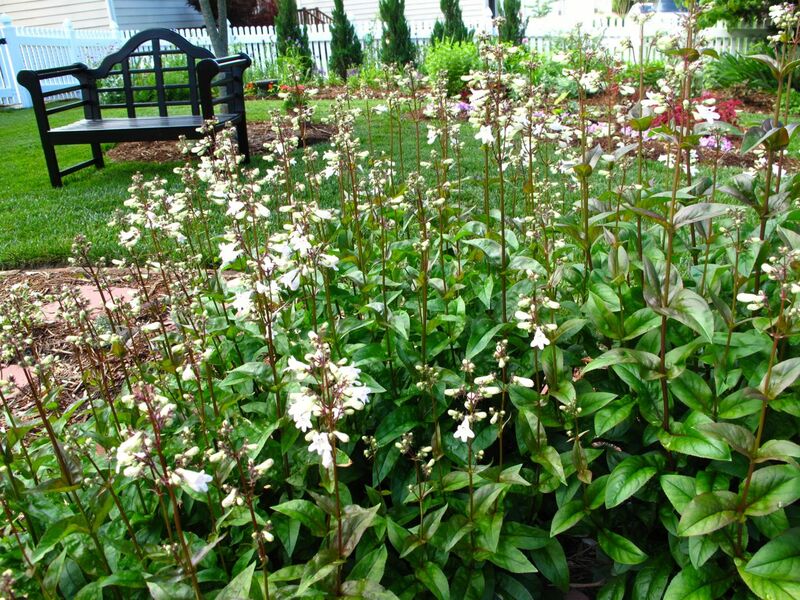 This entry was posted in garden and tagged meditation circle, meditation garden, meditation path, penstemon digitalis husker red on May 18, 2012 by pbmgarden. Today’s weather could not have been more perfect to have a group of friends visit the garden, walk the meditation circle and share a potluck lunch. Cloudless blue skies, low humidity and temperatures in the mid-seventies made for a fine day to be outside. 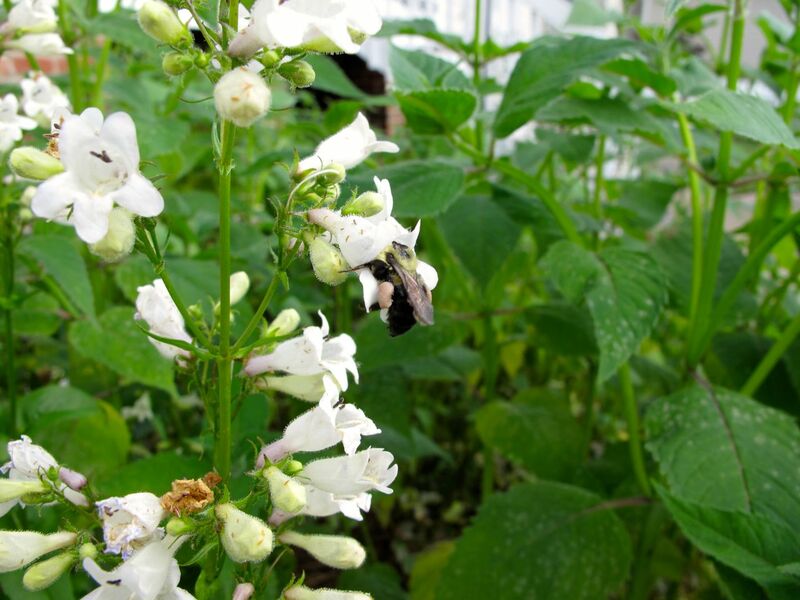 Inside the labyrinth Penstemon (Beardtongue) hybrids are blooming this week and buzzing with bees. 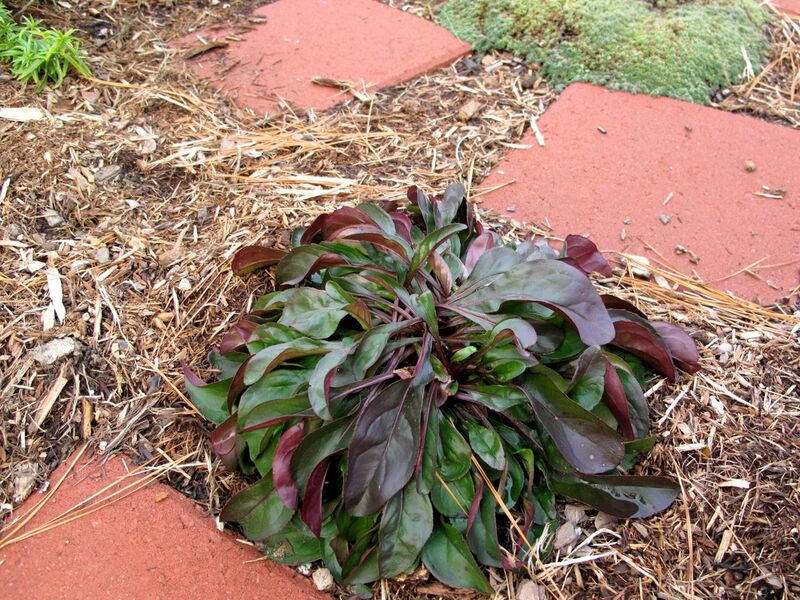 Penstemon mexicali ‘Pike’s Peak Purple’ delineates a long stretch of path near an outer edge. Its color is deep and rich violet-purple. Its loose form means it sprawls over into the paths on either side, making it necessary to trim the overhanging flower stalks to help keep visitors safe when walking the labyrinth. Marking several turnaround points in the labyrinth is another penstemon cultivar, Penstemon digitalis ‘Husker Red.’ This variety has a tighter and more upright form, making it more suitable and requiring less maintenance in the narrow space between the paths. 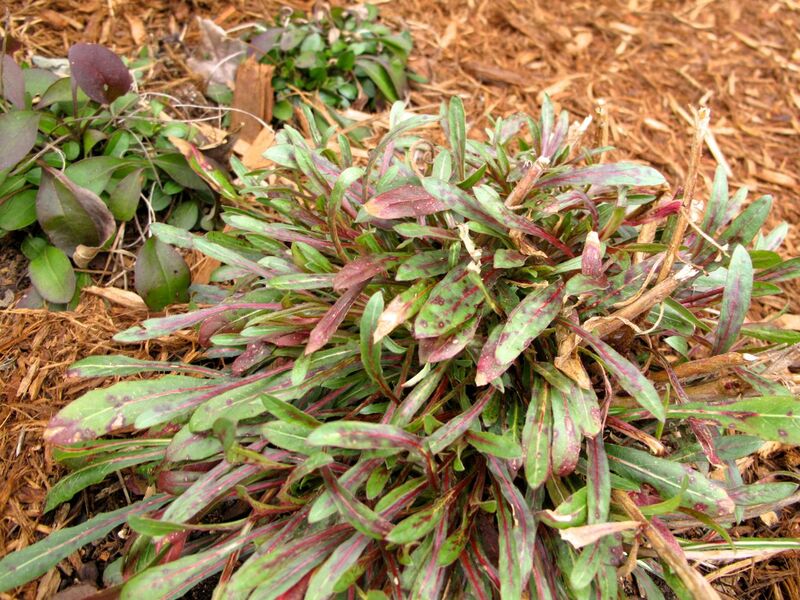 Both Penstemon cultivars remained green during this past mild winter. 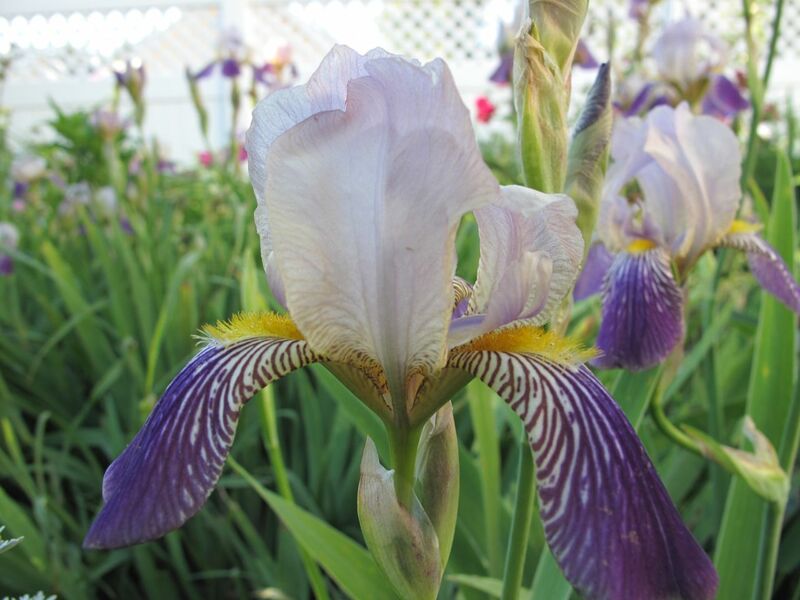 The garden has transitioned away from the focus on roses and irises, but a few Bearded Irises linger. 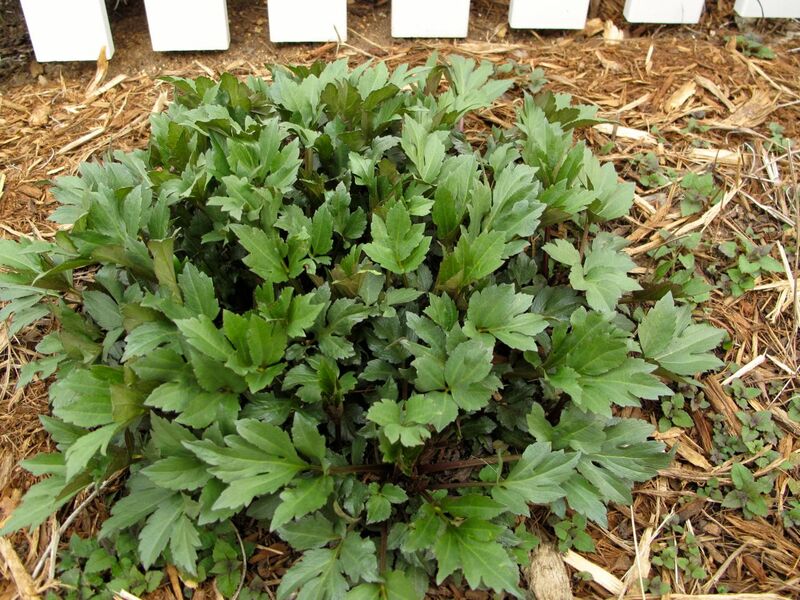 This entry was posted in garden and tagged almanac, Bearded Iris, Iris germanica, meditation circle, meditation garden, meditation path, penstemon, penstemon digitalis husker red, peony, walking the labyrinth on May 11, 2012 by pbmgarden.